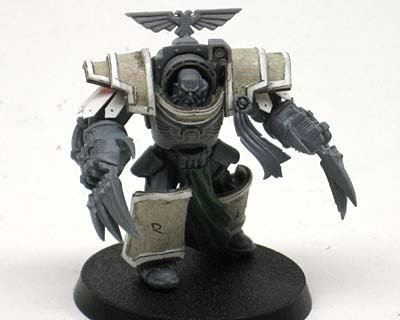 Since I'm using Dark Angels rules for my White Scars and I want the few Terminator squads I have in the army to count as scoring units... I need a "Belial." I used the plastic Chaos Terminator with some converion work for my version of him. I went with the pair of Lightning Claws because it's hard to pass up the claws that come with the model, they are so cool looking. Since this post is fairly old, I'm adding a few more links to bring it up to date. I really like this mini! The armor is great, and I agree, the lightning claws look pretty sharp (2d6 pun damage). He looks excellent, you've done some fine conversion work. I look forward to seeing him painted. That model is extremely awesome. While I like most of the conversions I am just not sure about the claws. Since I know they are chaos parts, they just do not seem right. They certainly look wicked. I like the beefed up leg-plates and shoulderpads. The leg-plates are wide and blank enough that you could paint one of your banner-style works on them. My God, that would be impressive. Hopefully I'll get him painted just well enough that he looks good but not so much that he draws any additional fire. eriochrome: They don't look as Chaos as they look a little more archaic... like they are the pre-cursors to type of claws in service today. I shaved of the spikes and Chaos elements. Hopefully the paintjob will carry that along too. Master Darksol: I left the leg plates open since I'm not sure what to do with them yet. I do like the idea of a banner style work put on them. That's a good idea. Looking forward to see it painted, and yes, some kind of mural work on the greaves would just add another pint of awesomeness to the model. Oh man. I am trying to find a link to a page I used to love to ogle. It was a French site (I think) and the guy did awesome custom sculpts of Primarchs and such for commission. However, he also had a 'how-to' with a fairly easy looking way to do custom shoulder pads and grieves that would look awesome on this guy. It may be in my favorites on my pc at home, I'll check tonight. It's a great site for inspiration regardless. Found it! Scibors fancy armor tutorial. I've not tried his method yet, but it looks reasonably straight forward. Be sure to check out all his past work too. Nice stuff! The Inner Geek: Thanks for the link, I've been a fan of his stuff for a while as well. While his technique looks easy, it is difficult to master and I'm sure there are some finer points to getting your armour to come out correctly. I went with a real simple version of his approach using the materials I knew how to manipulate best. I wish I could do the kind of work he does. lightning claws is definetly the way to go with belial. Not sure if you already have a tutorial on how to make the shoulder pads and greaves but can you share how you did them? They really do look great. Anon: Thanks, the approach for making the greaves is similar to the shoulder pads but you can't make them and then just glue them on. Each greave needs to be custom made because each leg is in a different position. This means that for each "pose," you would need a pattern to make the greaves from since pattern A for legs A wouldn't work on legs B. The shoulder pads have only one pattern and it fits all shoulders. This just adds some time to the process but other than that, the construction is the same as the shoulder pads.